Folk black metal band Hiverna from Québec of Canada, has finally released the second part of a dilogy that started in 2010, but was composed many years earlier! The band was formed in 2006 by Bardunor (David Verret – also in Monarque, Crépuscule, Barol Svinge, Csejthe and Demain, Wendigo) and Helorth (later left the band), but the first sparks were actually lit back in 2004. 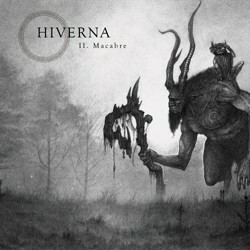 The first release of Hiverna was the split album in 2008 with Chasse-Galerie, entitled “L’Aube Septentrionale“. In 2010 the band released its debut full-length album “I. Folklore” and 4 years later, in June 2014, the second part “II. Macabre” was out via Oaken Forge, Bardunor’s own label. Meanwhile, in 2011 Hiverna released the 35-minute EP “Hiver, Nostalgie & Amertume“, including 3 old remastered songs, composed between 2007 and 2008. Hiverna continue in the style of their debut album, trying to improve some technical details and present something more solid. The term folk black metal finds in Hiverna one of its most accurate definitions. The band has a somehow underground, yet well-produced sound, while their orchestrations sound rich, without using many synths. The 12 songs of “II. Macabre” last for almost an hour and despite its long duration, every minute of this album is very interesting! There is quite a variety in their compositions; there are parts inside the songs where they play raw aggressive black metal, enriched by folk instruments, parts where they play melodic pagan black metal and the folk elements are “hidden” inside the guitar tunes and parts where they play pure folk metal or acoustic folk. Of course the band reveals also an interesting experimental mood, with some more atmospheric parts and few technical progressive elements. Guitars and flutes are clearly their most dominant instruments. Bardunor’s guitar playing varies from cold rhythmic riffs and melodic pagan leads, to atmospheric acoustic guitars, all with a raw unpolished sound. Doom’s beautiful flutes have a melodic and natural sound, adding a unique dark melancholic folk touch in the songs. There is something very personal and distinctive in her flutes; I think she combines elements of local folklore with influences of classical music in a very interesting result. The addition of guest violin in some songs works very good, especially for the atmosphere of the album. Bardunor’s vocals are mostly on the brutal side and his raw black metal screams sound somehow “deeper” compared to the debut album. The band still uses French lyrics and if you speak the language you can find them all in the CD booklet. If you have listened to the first album of the band, then you know what to expect. There are not significant differences between the two albums, except for a slight improvement in the sound. After all they are both part of a dilogy and were both composed between 2003 and 2006. If you are a fan of folk black metal I recommend both albums to you. “II. Macabre” is released via Oaken Forge in a jewel-case edition CD with slipcase and a 16-page booklet with Olivier Villoingt’s amazing cover painting! You can visit the band’s official pages below and listen to their entire discography, or find details on how to purchase the album.